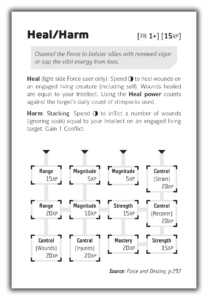 Now that all of the career books for Force and Destiny are published and we are unlikely to see very many more Force Powers enter the game, I'm releasing a deck of Force Power cards. It includes the base effect of every power and references to each upgrade tree: named upgrades and their costs. The reverse of each 4-by-6 inch notecard is blank lines for writing the effects of the power upgrades in more detail. As with my unofficial datapads, printing instructions are included in each document and the notecards are formatted for A4, Letter, and Legal paper sizes. 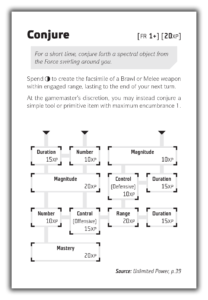 Each Force Power card lists its book and page number for easy reference to complete descriptions. 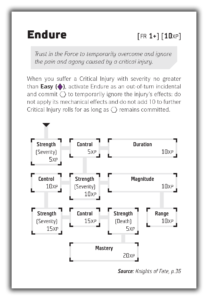 Some of the upgrade names on the cards are longer than in the book: they have parenthetical tags to help distinguish between multiple instances of the same upgrade type (Control, Duration, Magnitude, etc.) with different mechanical effects. 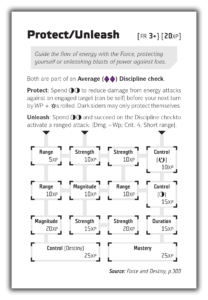 When tracking which upgrades to a power a character has learned, shade in the light gray sides of that upgrade's box and any connecting lines. 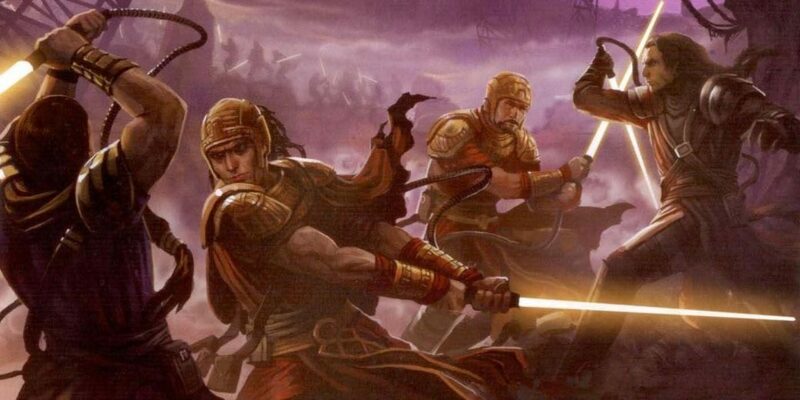 I have deliberately not included any descriptions of power upgrades in order to avoid fully duplicating the content of the books. 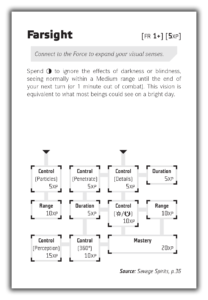 If you're intrigued by one of the powers in the deck and want your character to learn that power in your group's game, please support Fantasy Flight Games and the hobby by purchasing a copy of the appropriate official book with a full description of the power, either at your friendly local game store or from FFG's website. P.S. 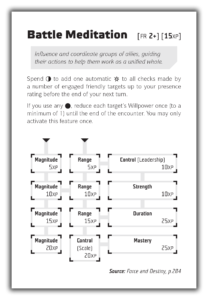 I've made several editing and proofing passes over the deck, but the upgrade trees are particularly finicky to get right. Please contact me if you notice any errors, especially costs and connecting lines between upgrades.